Rachel's Nest: Small Wall review and giveaway! I'm so excited to share this product with you, and to host my very first giveaway! First, let me tell you about Small Wall and why I like it so much. I run to the paint store, grab 5-6 cans of sample paint, then excitedly go home and slap the samples up on the first wall I see! I don't have a lot of patience...I want to see my colors up on the wall right away! Often, it takes me weeks to decide on a color and paint the room, so I end up living with random colors all over my walls (not so cute if I'm having company over!). 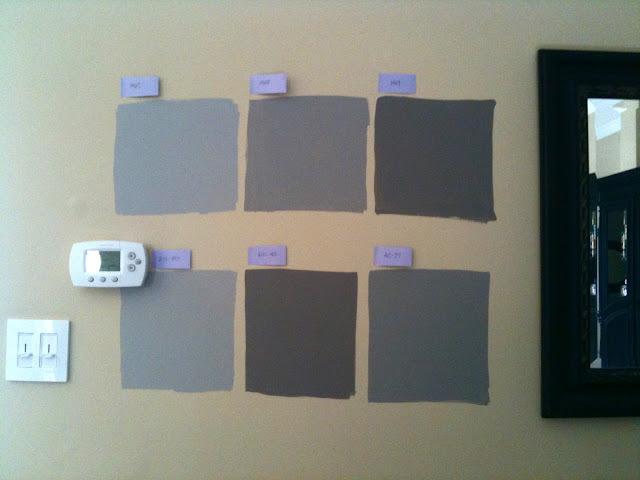 Before I painted my living room gray, I had 6 different swatches on the wall! I painted them a little too thick, so I had to sand them down and prime them before painting the room. That was pretty annoying! I've tried painting the sample colors on poster board or foam board instead of my walls to combat my previous problem, but unfortunately, this comes with it's challenges too. Often times, the board will warp when the wet paint goes on, and it can become too heavy to adhere to your wall with tape that will not damage it in the process. Not to mention, I'm just too impatient to cut up a piece of board and tape it to my wall! 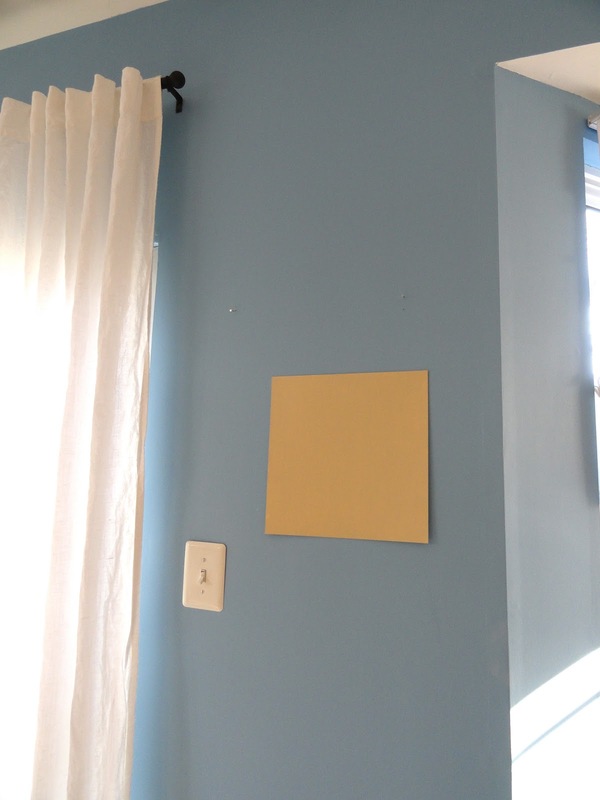 Small Wall is exactly what it sounds like...a small wall to paint your sample colors on! It has an adhesive strip on the back, so all you have to do is paint your color on it, peel the paper off the strip, and hang it on your wall! Each package of Small Wall contains two 12x12" sample boards. After my 48 hour test, I even repositioned it several times to test the adhesive, and it stuck to my wall just as well as it did the first time. This is an especially great feature so that you can move your sample board around the room to test it against different furnishings, art and draperies. You can even repaint it to test a completely different color! You can purchase Small Wall at Sherwin Williams for $5.69, Ace Hardware for $5.99-$7.99 (depending on each individual retailer), and at Amazon for $8.99. Small Wall is sponsoring a giveaway where 3 lucky winners will receive one package of Small Wall each! I will announce the winners in a separate and brand new post. Entries for this giveaway will close on Thursday, March 15th at 9pm EST. *Disclaimer: This product was sent to me for review, but all opinions are 100% my own. I was not compensated in any way for this review and I have no affiliation with Small Wall. I was just looking at these Sunday when I went to SW! My favorite paint color right now is the Marble Tile that I'm painting my bathroom with. Thats a really cool product! Hope I win! :) I am currently loving Notable Hue SW 6521! I'm really loving BM's Alexandria Beige. What a cool product! We will start painting all of our rooms this spring/summer to get rid of the junky builder grade paint. That's such a good idea! My favorite color is currently SW Framboise If I win, I'd be able to go buy some and take it around to figure out where I could actually use it in my house! I love this! I'm about to change all of my colors for spring. I love the jewel tones but will probably have to go lighter in my house. This looks like a great product. Can't wait to try it out. My favorite color right now is Benjamin Moore affinity Venetian Portico AF-185. My husband and I just bought a new house and are trying to pick out paint colors! The Small Wall would be perfect! My current fave is Revere Pewter by Benjamin Moore! I live in Johannesburg, but I have parental property at Cape Town, which is my home town. Recently, I received a request from my tenants to repaint the home, so I decided to find out the chap and best painter in the city, and help my tenants in carrying out their home improvement crusade successfully.